GiftTree Review & Giveaway CLOSED!! I love finding great gifts that I can send to family and friends for all different occasions. My husband and I have family all over and so when it comes to sending gifts, we turn to online resources for most of our shopping. One site that I love to shop at when it comes to finding gifts and sending them to our friends and family is GiftTree.com. Over at GiftTree.com they have a great selection of gift baskets and wine and champagne gifts. Whether you are looking for a gift to send that says that you are thinking of someone or a gift to celebrate a special occasion, they have the gifts you are looking for. We received Two Dozen Fresh Baked Cookies for review, courtesy of GiftTree.com. These cookies came in three separate boxes that had a very nice bow wrapped around each box. We have all enjoyed each flavor. With each cookie individually wrapped, it keeps these cookies fresh and soft. We received a box with snickerdoodle, chocolate chip and peanut butter that were each just amazing melt in your mouth cookies. 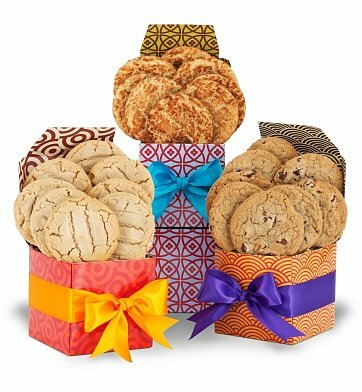 The wonderful people over at GiftTree would also like to give one of my readers the same gift, the Two Dozen Fresh Baked Cookies to give as a gift or keep for themselves!!! Like GiftTree on Facebook, then come back here and leave me your email with this entry!! This giveaway is open to US residents. This giveaway will end at 11:59 pm on July 25,2011. Winner will be chosen at random.org and will be given 48 hours before another winner will be chosen. All products for reviews and giveaways are given as a sample from the companies. All opinions in reviews I conduct are my own. I was not paid to say anything or review any products. Next Post eChook Digital Publishing Giveaway Closed!! I liked GiftTree on FB!Thanks!Jennlearnquilling@gmail.comI Love Making Hair Bows! I like Gift Tree on Facebook and I love cookies. Thanks for the chance to win. I liked GiftTree on Facebook !Thanks!Jennlearnquilling@gmail.comI Love Making Hair Bows! I liked Money Tree on FB! I'm entered to win the Pampers giveaway!